A visitor walking westward along the Thames from the Tower of London towards Blackfriars passes from Tower Street Ward, through Billingsgate Ward into what used to be Bridge Ward Within (it is now simply "Bridge Ward," the former "Bridge Ward Without" now - since 1978 - forming part of the London Borough of Southwark). 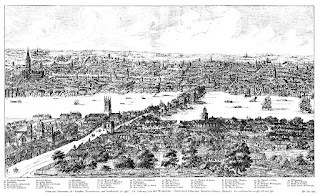 London Bridge has existed for almost as long as the City itself, and, for most of London's history, was the only fixed crossing point of the Thames below Kingston (sixteen miles to the west). The Roman General, Aulus Plautius, may well have established a pontoon bridge here in 43 AD, to facilitate the passage of the Emperor Claudius, with his war elephants, on their way to accept the surrender of British tribes at Camulodunum (Colchester). 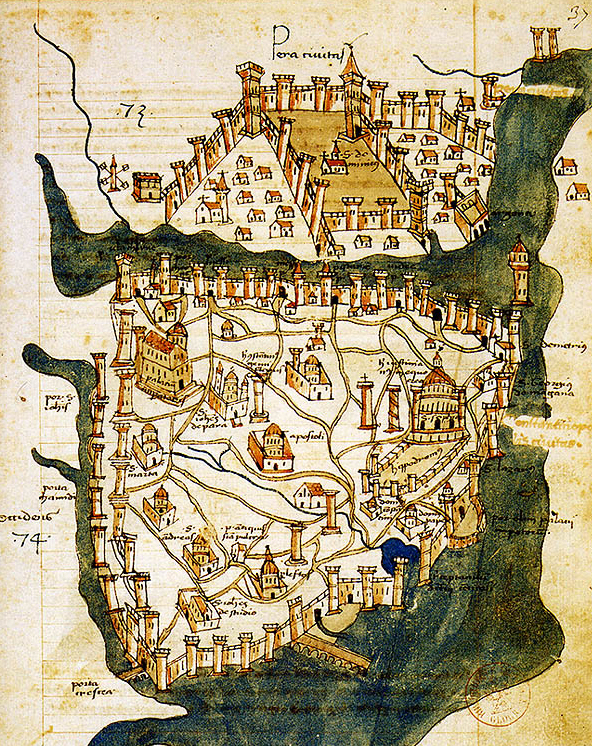 A more substantial Roman bridge was subsequently put in place to channel road traffic, including troop movements, from the north, east and west, southwards towards the key channel ports of Richborough and Chichester. 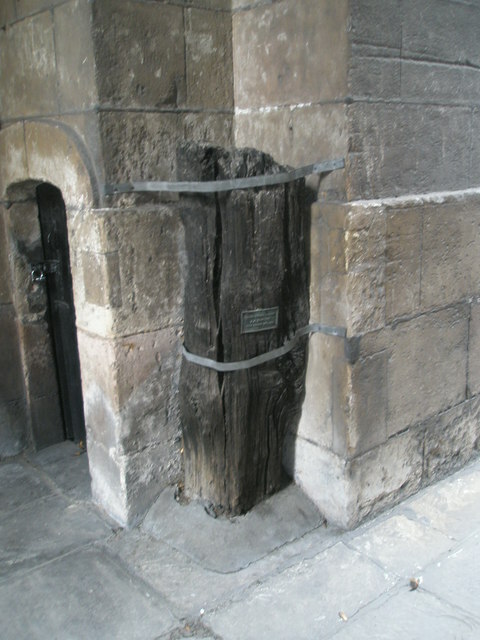 Roman wooden piling found beneath the bell-tower of the Church of Saint Magnus the Martyr, at the northern end of London Bridge. This would either have been part of a late 1st Century AD bridge, or part of the adjacent wharf. Photo: Basher Eyre (licensed under CCA). It was King Henry II, as part of his penance for the deadly sin of wrath (specifically, the murder of his former friend and advisor, Thomas Becket), who established a religious guild, "The Brethren of the Bridge," in 1176, to oversee the construction and maintenance of a new stone bridge, which was not completed until 1209, during the reign of his son, King John. At the heart of this new project was a chapel, dedicated to the memory of Saint Thomas (he had been canonised in 1173). 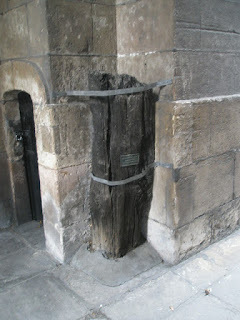 There were, in fact, two chapels, one above the other: the uppermost accessible from the bridge itself (where most of Chaucer's Canterbury pilgrims would have prayed before crossing the bridge into Southwark); the lower chapel accessible to the humbler fishermen and ferrymen at the level of the river. 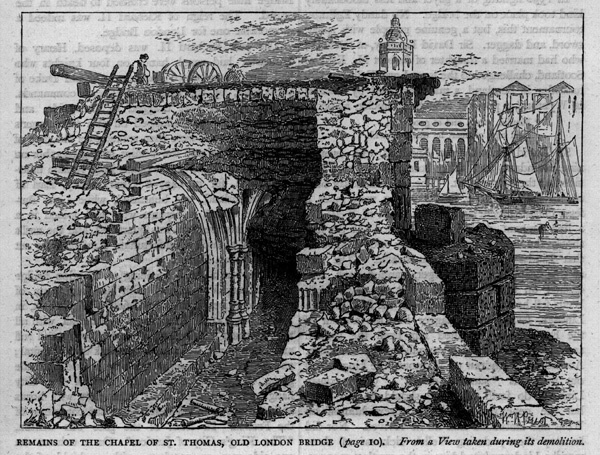 Remains of the vaulting of the lower Chapel of Saint-Thomas-on-the-Bridge, revealed during building works in the 19th Century, engraving by Edward William Cooke (image is in the Public Domain). It was King John, short of funds, who first rented out space on the bridge itself for merchants to build houses and commercial premises, and, by the mid-Thirteenth Century, most of its surface was occupied by buildings. Defence and taxation were among the key considerations in the design of the bridge, which had a fortified bastion at either end, and a drawbridge that could be raised, either to keep rebels from crossing into the city, or, at slack tide, to allow merchant vessels to enter and leave the upper part of the Pool of London. 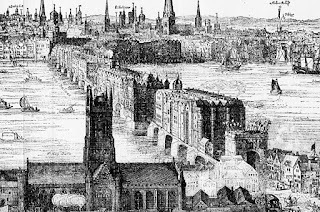 Old London Bridge in 1632, Claude de Jongh (image is in the Public Domain). The bridge was supported by nineteen arches which, together, slowed down the flow of the Thames to such an extent that the water above it could easily freeze over during the course of a cold winter. 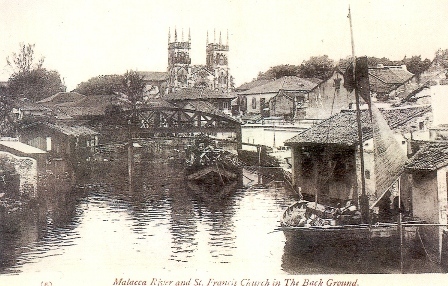 In the aftermath of heavy rainfall, on the other hand, and at the ebb tide, "shooting the bridge" in small craft became a dare for foolhardy boatmen, at risk both of being dashed against the stone piers, and of being pelted with ordure from the public and private latrines above. Panorama of London in 1543, 19th Century engraving by Nathaniel Whittock, from an original by Antony van den Wyngaerde, Bodleian Library (Image is in the Public Domain). 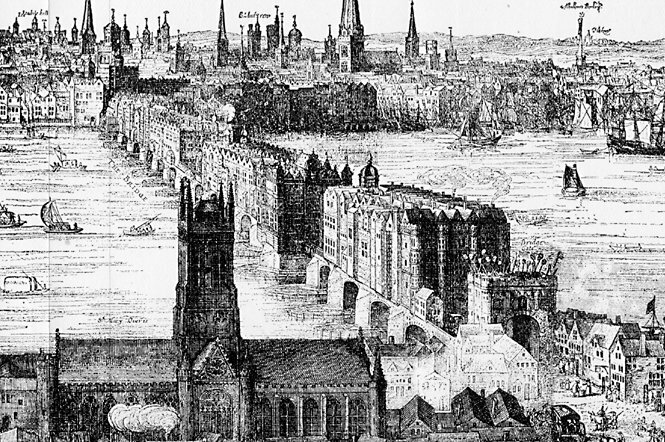 London Bridge in 1616, by Claes van Visscher, showing the heads of executed criminals impaled above the southern bastion (image is in the Public Domain). The "Brethren of the Bridge" was dissolved in the course of the Protestant Reformation, and their chapel converted to secular use, although some, at least, of its members must surely have had the satisfaction of seeing the head of their nemesis, Thomas Cromwell, impaled on a pike on the southern bastion of the bridge. 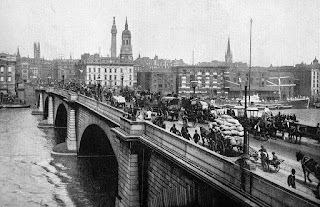 The buildings on the bridge were demolished in 1756, in order to speed up the flow of traffic. 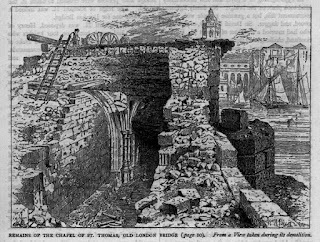 "Old London Bridge" was finally demolished in 1825, to make way for a new stone bridge, designed by Sir John Rennie, which opened in 1831. It was Rennie's bridge, in turn, that was sold to the American oil-baron, Robert McCulloch, in 1967, and re-erected at Lake Havasu City, Arizona, making way for the current road bridge, designed by Lord Holford, and opened in 1972. 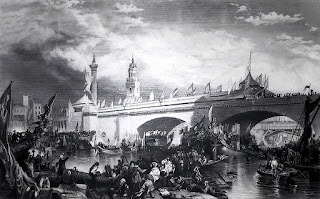 The opening of Rennie's New London Bridge in 1831 (image is in the Public Domain). 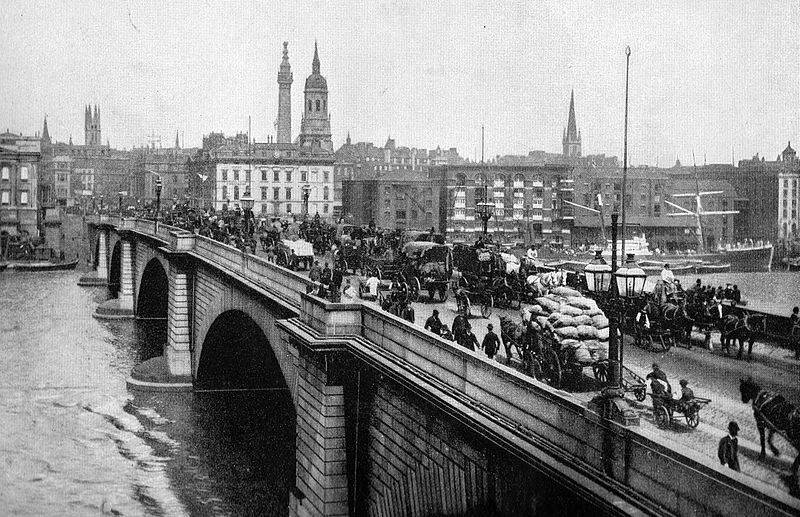 London Bridge, c 1900. Photo: John L. Stoddard (image is in the Public Domain). Individual bridges have come and gone over the centuries, but the significance of this particular crossing point has endured: an axis, from Southwark in the south, across the bridge itself, and along Gracechurch Street and Fish Street on the northern side; an axis of arrivals and departures, of meetings and leave-takings; of hopes realised and hopes dashed; the streets of London paved, not with gold, but with innumerable stories. There are few substantial land-masses in the world more remote than New Zealand, fifteen hundred kilometres distant from Australia in one direction, and nine hundred kilometres from the Polynesian islands of Fiji and Tonga in the other. As such, it is unsurprising that it was one of the last such land-masses to be settled by humans. Whilst, in the Old World, the civilisations of Assyria and Egypt; Greece and Rome, rose and fell, the wild animals of New Zealand (including such evolutionary oddities as the flightless moa and kiwi) had their islands to themselves, an Eden without an Adam or an Eve to name or exploit them. 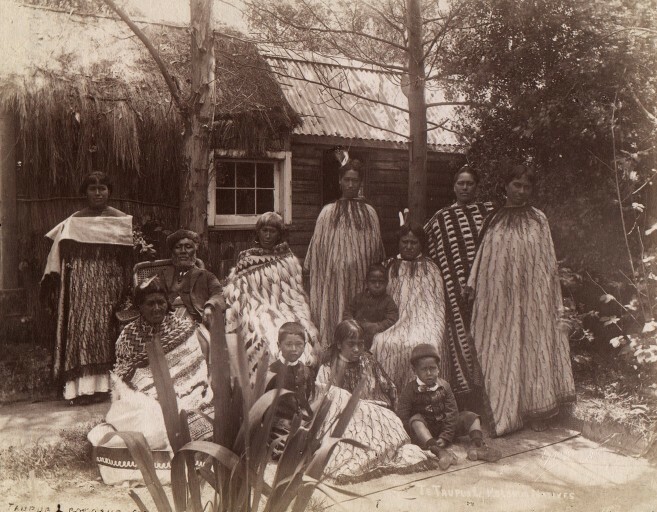 The first Polynesian colonists seem to have arrived in the second half of the 13th Century AD, and their descendants, the Maori, who named the islands "Aotaroa," went on to develop one of the most sophisticated civilisations of the Pacific region. Their first encounter with Europeans was, ominously, a violent confrontation with the Dutch crewmen of Abel Tasman in 1642. The coastline of New Zealand was mapped in much greater detail by James Cook, in 1769, and the territory became a colony of the British Crown in 1841. 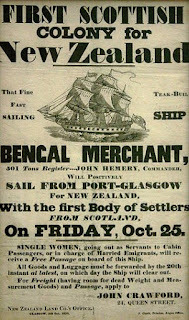 It was settled, neither with slaves (as the American colonies had been), nor with convicts (as in Australia), but by families from England, Scotland, Wales and Ireland, coming in the hope of a better life, initially from sheep-farming, and trade with the Maori. 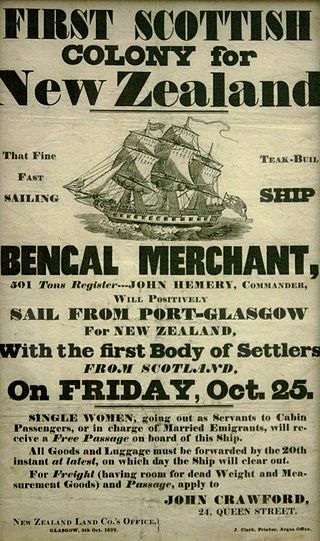 New Zealand emigration poster, 1839 (image is in the Public Domain). A Maori family in the 1880s, by Josiah Martin, Musee de l'Homme, Paris (image is in the Public Domain). Everything changed, however, when gold was discovered in the Otago district of New Zealand's South Island in 1861. 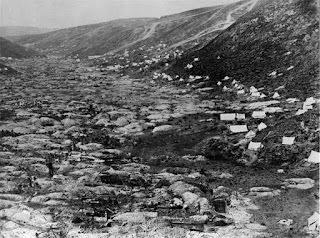 European prospectors, many of whom had been disappointed in the earlier gold rushes of Australia (1851), Colorado (1859) and British Columbia (1860), flocked to New Zealand, where they were joined by a small army of Chinese labourers. Predictably, there were always many more prospectors than there were fortunes to be made, and, whilst many trusted to luck, there were others quite prepared to use criminal means to prey on the luck of the fortunate few. New Zealand's "Wild South" was every bit as wild as its Western American equivalent. 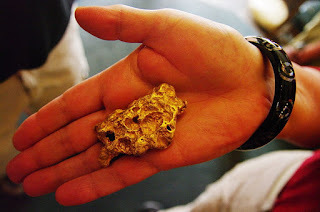 Gold nugget from Arrowtown, Otago. Photo: Bgabel (licensed under GNU). 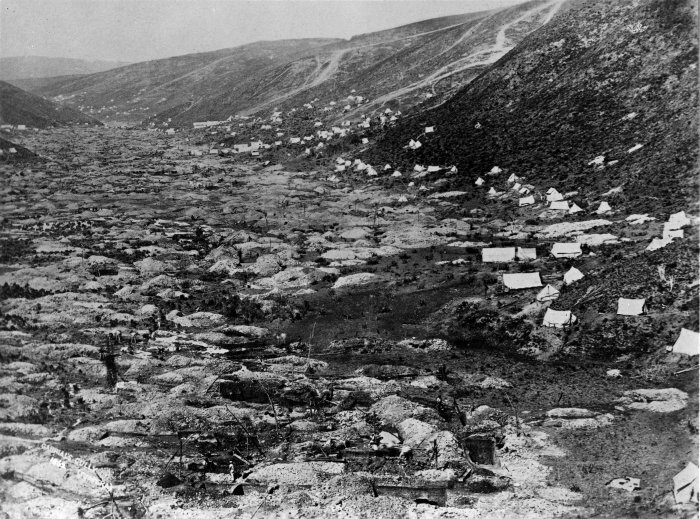 Gabriel's Gully, Otago, in 1862, showing the tents of prospectors. Photo: Harry Gore, National Library of New Zealand (Alexander Turnbull Library) - image is in the Public Domain. 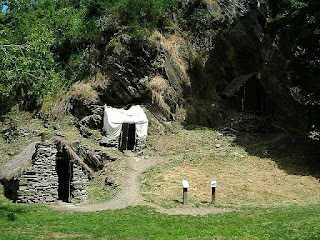 Reconstructed huts of Chinese prospectors at Arrowtown. Photo: Rob Young (licensed under CCA). By 1864, the attentions of the prospectors had shifted from the inland gold-fields of Otago to the western coast of South Island, around the settlement of Hokitika, already a place of importance to the Maori as a source of pounamu (jade), which they valued far more highly than gold. 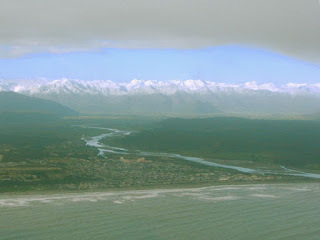 Hokitika Bay. Photo: HerrSchnapps (licensed under CCA). 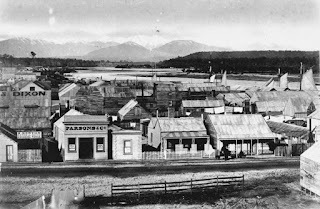 Hokitika township in the 1870s. Photo: James Ring (1856-1939), National Library of New Zealand (image is in the Public Domain). 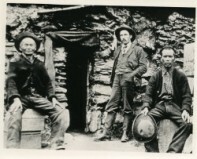 Chinese miners at Arrowtown. Photo: National Museum of New Zealand (image is in the Public Domain). 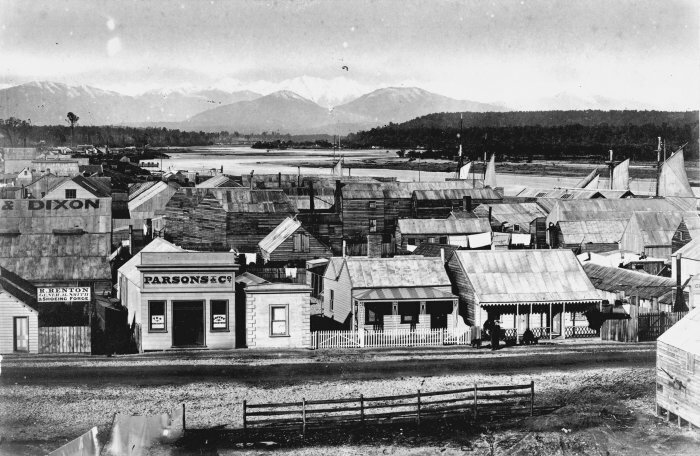 1860s Hokitika, a small and hastily built settlement in which Europeans, Maori and Chinese live uneasily together, provides the setting for Eleanor Catton's novel, The Luminaries. An apparently luckless prospector has been found dead, and an unexpected fortune has been discovered in his home. Another prospector, thought to have been far more successful, has disappeared without trace. A group of twelve men gather in a hotel to unravel this series of interconnected mysteries, and into this gathering steps a stranger, Walter Moody, but, in a community that has greed as its principal common denominator, nobody knows who they can trust. 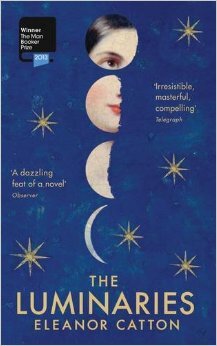 Wherever Europeans have trusted their destinies to fortune, they have taken astrology with them, and astrology is one of the structuring principles of this novel. Catton cheerfully, and magnificently, breaks many of the established "rules" of modern creative writing. Her Nineteenth Century story is written in Nineteenth Century idiom (third person omniscient; unafraid to tell, as well as show), which few contemporary writers could pull off successfully. At 832 pages, it is a longer novel than most publishers would wish to receive from a debut novelist, yet it manages, still, to be a page-turner, the sort of novel that Charles Dickens might have written if he had known Hokitika as well as he knew Rochester. 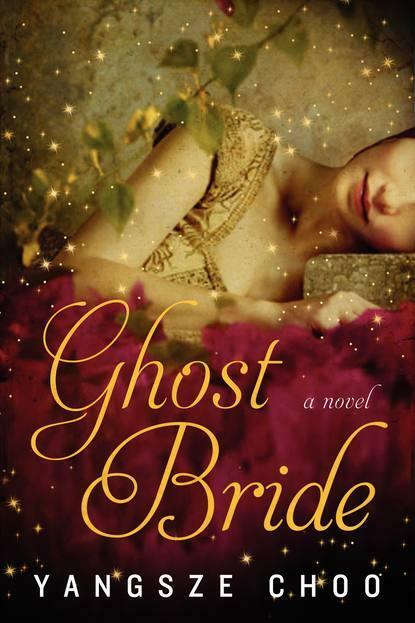 Its themes (including identity theft, ethnic stereotyping, drug addiction, the sexual exploitation of migrant women), are surprisingly modern in a historical novel, yet based on close and detailed research. "Moody's natural expression was one of readiness and attention. His grey eyes were large and unblinking, and his supple, boyish mouth was usually poised in an expression of polite concern ... He was not quite eight-and-twenty, still swift and exact in his motions, and possessed of the kind of roguish, unsullied vigour that conveys neither gullibility nor guile ... He had, in short, an appearance that betrayed very little about his own character, and an appearance that others were immediately inclined to trust ... "
Shepard's autobiography (a document which, if ever penned, would be rigid, admonishing and frugal) did not possess that necessary chapter wherein the young hero sows his oats and strays ... He had always been irreproachable in his conduct, and as a consequence, his capacity for empathy was small. Anna Wetherell's profession did not fascinate him in the least, and he had no boyhood memories of tenderness or embarrassment to soften him towards the subtleties of her trade; when he looked at her, he saw only a catalogue of indiscretions, a volatile intelligence, and a severe want of promise. That a whore might attempt to take her own life did not strike him as a remarkable thing, nor a very sad one; in this particular case, he might even call a termination merciful. Miss Wetherell lived by the will of the dragon, after all, a drug that played steward to an imbecile king, and she would guard that throne with jealous eyes forever." 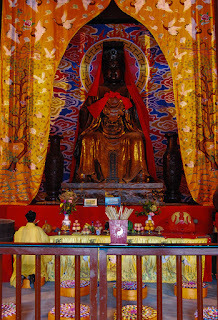 "But onward rolls the outer sphere - the boundless present, which contains the bounded past. This story is being narrated , with much allusion and repeated emphasis, to Walter Moody - and Benjamin Lowenthal, who is also present in the smoking room of the Crown Hotel, is hearing parts of the tale for the very first time. Suddenly he is put in mind of an event that occurred some eight months prior. When Thomas Balfour pauses to drink, as he is doing now, Lowenthal steps forward, around the billiard table, and raises his hand to indicate that he wishes to interject. Balfour invites him to do so, and Lowenthal begins to narrate the memory that has so recently returned to him, speaking with the hushed gravity of one conveying very important news ... "
My blog-post, at the end of last year, on Great Books of 2015 sparked a lively debate around the definition of historical fiction: can a novel such as Emily Bullock's The Longest Fight (one of my favourite novels of last year) be considered to be "historical," when it is set in a time-frame that is still within the living memory of many people (in this case, the 1950s)? Perhaps it depends on the author's relationship to the time period (neither Emily Bullock nor I was alive in the 1950s), or perhaps it depends on how much has changed in the time that has elapsed between the setting and the writing of the book? A new film and exhibition have led me to revisit some of these questions. The Turkish Nobel laureate, Orhan Pamuk, has written both historical fiction (My Name is Red, set in the Sixteenth Century; The White Castle, set in the Seventeenth Century) and contemporary fiction (The Black Book, The New Life, Snow). His most recent novels (The Museum of Innocence, The Silent House, The Strangeness in My Mind) occupy the same liminal ground as The Longest Fight, with settings that are semi-historical or almost contemporary. 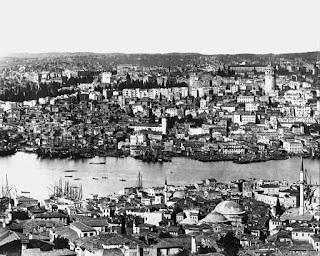 Common threads link much of Pamuk's historical and contemporary fiction; including the city of Istanbul (more specifically the streets of the Nisantasi district, where he himself grew up, and nearby Beyoglu, both on the European side of the Bosphorus), frequented, alike by his historical and contemporary protagonists; and recurring themes, including forbidden or doomed love, the persistence of memory, and a peculiarly Turkish concept of melancholy, "Huzun." 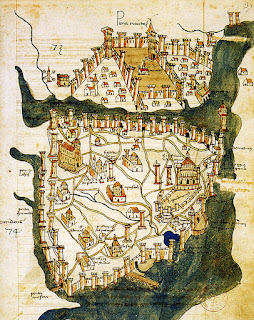 Constantinople in 1422, by Christofero Buondelmonti, showing the old Italian Quarter of Pera to the north of the Golden Horn, Bibliotheque Nationale de France (image is in the Public Domain). 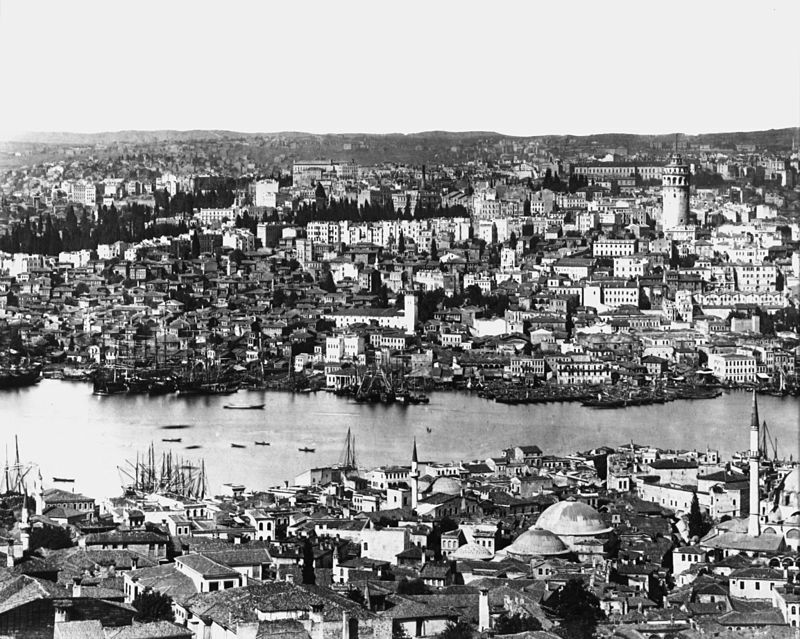 Galata and Pera from the south. 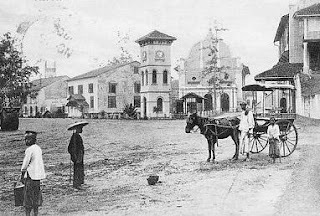 Photo: SALTOnline (image is in the Public Domain). The Museum of Innocence is set between 1974 and 1984, and concerns the doomed love affair between a wealthy businessman, Kemal, and a poorer distant relative, Fusun. Looking back on their relationship, Kemal eventually purchases the family home in which Fusun grew up, and sets about collecting objects and photographs that encapsulate his memories of her, and of the times they have shared. 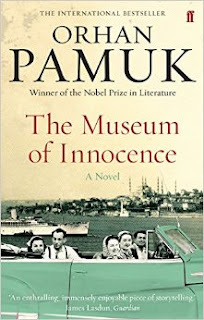 Pamuk himself began collecting artefacts in the mid-1990s, and always had in mind to create the novel and a physical museum in tandem with one another. 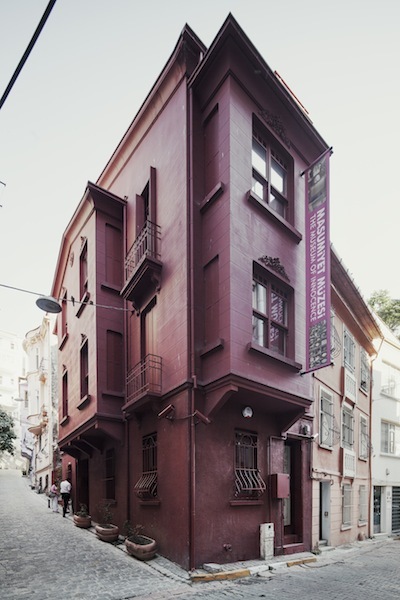 He purchased the house in which the fictional Kemal "established" his museum. The novel, published in Turkish in 2008 (and in English the following year), has 83 chapters, and for, each of these, Pamuk created a vitrine, or display case, for the museum. The novel and the museum tell the same story in different ways: one can appreciate the novel without having seen the museum, and vice versa. The Museum of Innocence, in Istanbul's Beyoglu district, known for its antique shops, where Orhan Pamuk collected many of the objects now housed within. Photo: The Museum of Innocence (licensed under CCA). 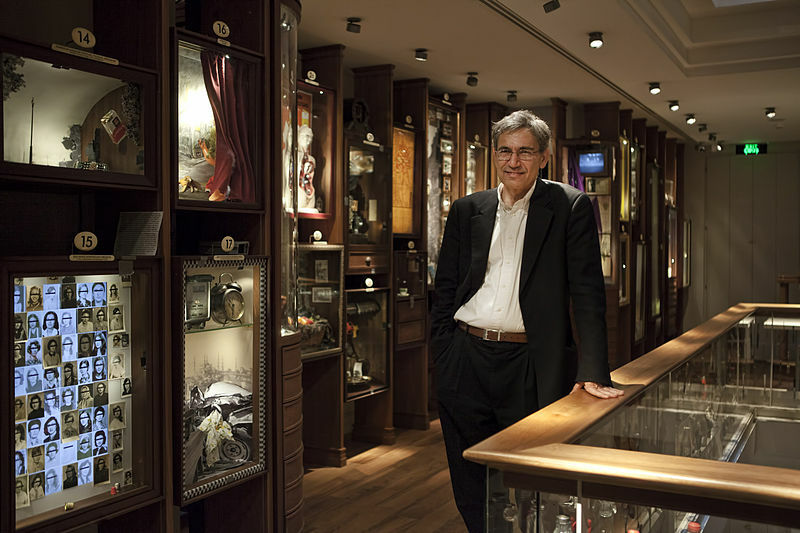 Orhan Pamuk, in Istanbul's Museum of Innocence. Photo: The Museum of Innocence (licensed under CCA). 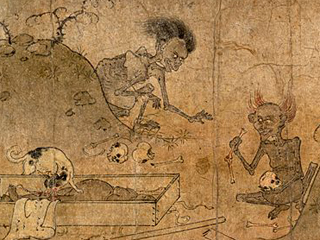 The story of Kemal and Fusun's romance has now been told in a third way. Grant Gee's film, Innocence of Memories, released last year in collaboration with Pamuk, combines footage of the museum itself, and of the streets on which it is set; commentary by "Kemal" himself, and by other characters in the novel, and people who have known "Fusun;" interviews with Pamuk; and extracts from the Turkish melodrama films watched by Fusun and Kemal during the course of their romance. Following on from his 2011 release, Patience (a complex "unravelling" of W.G. Sebald's novel, The Rings of Saturn), Gee is emerging as one of the most literary of the current generation of British film-makers, and his elision, here, of fact and fiction certainly adds a new dimension to Pamuk's original story. Innocence of Memories is currently showing as an extended run (until 11th February) at the British Film Institute, on London's South Bank. 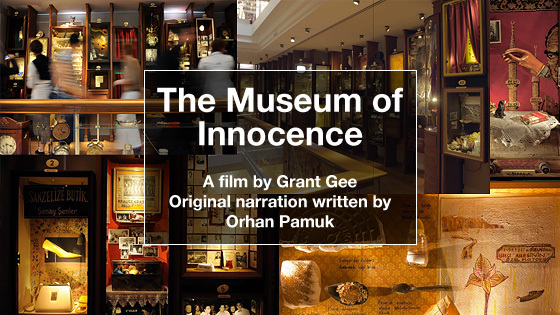 Directly across the Thames, Somerset House is hosting (until 3rd April), a mini-exhibition of some of the vitrines from Pamuk's Museum of Innocence (open daily, with free admission). Looking at these displays, in conjunction with the novel and the film, it is clear to me that, whatever the period of the setting of his story, Pamuk's approach, in researching and composing his story, is indeed a historical one. It poses the question, in my mind, as to whether "historical fiction" might be as much a literary technique as a literary genre? 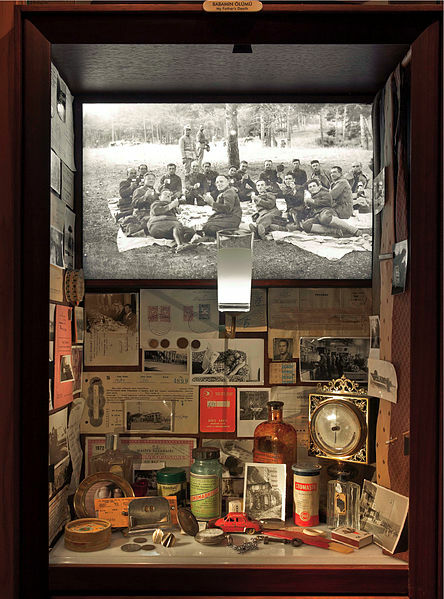 "My Father's Death," one of the vitrines from The Museum of Innocence, now on display at Somerset House. Photo: The Museum of Innocence (licensed under CCA). 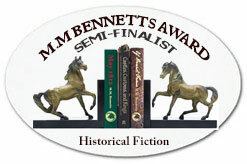 Objects play an important role in my own historical fiction, but most of these objects are already in museums. My stories have tended to be set further back in the past, and even if it were ethical to collect objects from the remote past (the trade in antiquities is a dubious one, involving illegal excavations, smuggling, faked provenances and the like), it would be prohibitively expensive. For the moment, at least, I am content to display images of them on my various Pinterest boards, but what my project has in common with Pamuk's is the way in which real places, and real objects, together act as signifiers of moments in the lives of my fictional characters, connecting their worlds to our own. "In physics," Pamuk's Kemal suggests to us, "Aristotle makes a distinction between Time, and the single moments he describes as the 'Present.' Single moments are - like Aristotle's atom - invisible, unbreakable things. But Time is the line that links them. My life has taught me that remembering Time - the line connecting all the moments that Aristotle called the Present - is, for most of us, a rather painful business. However, if we can learn to stop thinking of life as a line corresponding to Aristotle's Time, treasuring our time, instead, for its deepest moments, the lingering eight years at our beloved's dinner table no longer seems strange and laughable. 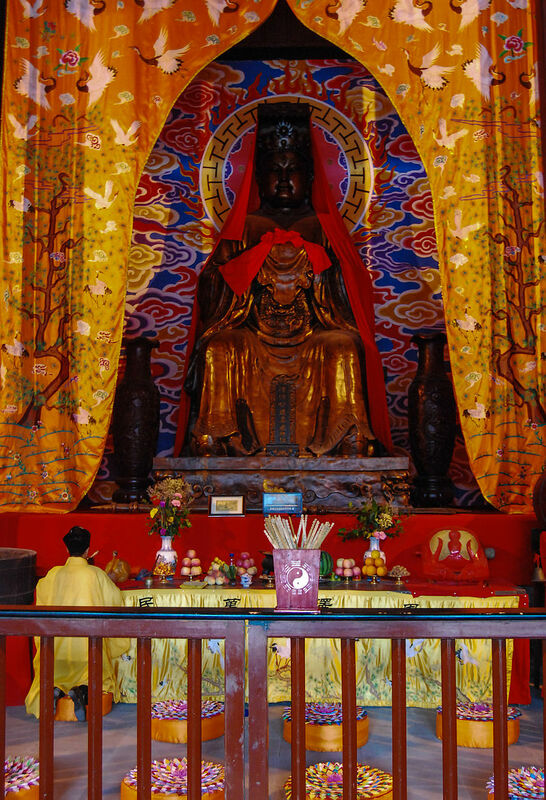 Instead, this courtship signifies 1593 happy nights by Fusun's side." Post-Script (added on 6th February 2016): for Orhan Pamuk's own perspective on the film, please click here.